260 pages | 73 B/W Illus. While the interdisciplinary field of materials science and engineering is relatively new, remarkable developments in materials have emerged for biological and medical applications, from biocompatible polymers in medical devices to the use of carbon nanotubes as drug delivery vehicles. Exploring these materials and applications, Materials in Biology and Medicine presents the background and real-world examples of advanced materials in biomedical engineering, biology, and medicine. 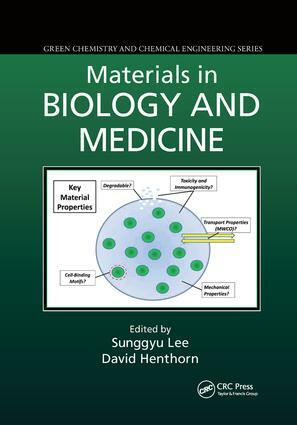 With peer-reviewed chapters written by a select group of academic and industry experts, the book focuses on biomaterials and bioinspired materials, functional and responsive materials, controlling biology with materials, and the development of devices and enabling technologies. It fully describes the relevant scientific background and thoroughly discusses the logical sequences of new development and applications. Presenting a consistent scientific treatment of all topics, this comprehensive yet accessible book covers the most advanced materials used in biology and medicine. It will help readers tackle challenges of novel materials, carry out new process and product development projects, and create new methodologies for applications that enhance the quality of life. "… a timely addition to the field of … Cutting-edge articles by leading experts review critical areas covering biomaterials and biomimetic materials, materials function and response modification, and medical device development. Each application-oriented chapter provides the relevant scientific and engineering background with extensive references for further study and research. The contributors use multiple examples to provide rich insights into a broad array of biomaterial applications for a target audience consisting of graduate students, materials scientists, research engineers, and academic physicians and surgeons." Sunggyu Lee is a Russ Ohio Research Scholar and professor of chemical and biomolecular engineering at Ohio University, where he is also the director of the Sustainable Energy and Advanced Materials (SEAM) Laboratory. Dr. Lee holds 31 U.S. patents and has authored over 450 journal articles and conference papers. His research areas include alternative fuels, supercritical fluid technology, advanced material processing, chemical process engineering and reactor design, and polymer synthesis and processing. David Henthorn is an associate professor of biomedical engineering at Saint Louis University, where he directs the Laboratory for Therapeutic Materials. Dr. Henthorn’s research focuses on the use of polymers and polymer composites as biomaterials, the development of biosensors, and the fabrication of bioMEMS and drug delivery devices.